Home Starting a Business Motivation Get organized just to do more work…I quit! Get organized just to do more work…I quit! Organized; the ability to place your hands on something of value exactly when you need it. I love this definition. 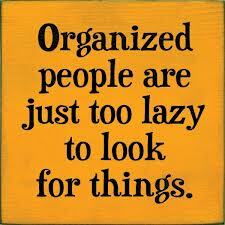 But after we organized people are organized, how do we reward ourselves? I work with quite a few clients on their procrastination issues around organization. One of my basic questions is, “What will you gain by becoming more organized?” Their answer is almost always the same, “More time”. “What will you do with that that time”, I ask. “More work” is the Universal reply! No wonder they are balking at becoming organized if it is just going to lead to doing more without reward. I had a boss once, where the better I performed, the more departments he gave me to run. My reward was just more work. Yes, I received the occasional pat on the back and the mandatory raises, but it seemed I was being punished for being such a go-getter. I felt that the more I did, the more I was going to have to do. There seemed to be no end to the work. So, I quit. And that’s exactly what a part of you might be doing right now. You ask that part of you to be more motivated, productive and organized just so you can give it more work to do…and it is quitting on you. Are you always rushing from one task to the next? Are you becoming organized just so you can heap more work on yourself? The motivation that moves us to become organized is so we can have more time to do the things we enjoy. But if you find yourself on the hamster-wheel-of-doing (expending a lot of energy but not getting anywhere) and you use organization just so you can run on that wheel even faster…at some point your motivation will quit on you. What to do? Just as we seek compensation in the form of a paycheck, there is a part of you that wants to be rewarded for a job done. And it has been found that money only comes in number 4 on your list of rewards. Acknowledgement is number one and number two is time off spent in an enjoyable activity. So, how can you reorganize your thinking and your schedule, to give yourself both when a task is completed? If an activity gets done before its allotted end time, do not rush into the next activity. Take that time and do something you enjoy; read a few more pages from the current book you are really into, or take a moment and close your eyes, breathing deeply to relax and let go. Could you get up and walk around for just a bit to get your energy moving again. What else can you do in just the space of a few minutes, yet it would bring a smile to your face, a sense of peace to your mind, a feeling of enhancement to your day? No one wants to work for an ungrateful boss. Reward your motivation and organization for a job well done and you will have a winning team of outstanding employees! Previous articleDigital Overwhelm? Find Your Filters.